Two double rooms and one triple room. Extra bed in the living room. The house is located in Medvidina Bay. 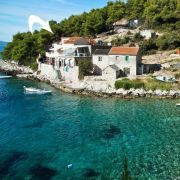 The … More » nearest town is Gdinj on the island Hvar.